For over a hundred years, the link between apes and man, popularly known as the “missing link”, has been the subject of research among the best scientists of the human race. The discovery of “one unique” evidence placed Britain to be a contender as the cradle of humanity. This discovery was for decades trusted by respected evolutionists as a concrete evidence to prove that their theory of evolution is a fact until another discovery was made public and was tagged as one of the worst crime of the 20thcentury. The link of England to antiquity, and its contention for being a cradle of human kind, and the link between humans and apes was cut by the alleged link turned scissors. Eoanthropus dawsoni was the scientific name of this alleged missing link, and it would have been an extremely early example of a creature showing both human and apelike qualities. At 375,000 years old, it put England in contention for a cradle of humankind, being found in the Sussex town of Piltdown. The “first Englishman” he was proudly called when the anthropologist Charles Dawson found him in 1911. For decades, Piltdown Man was cited along with Neanderthal man and Heidelberg man as an example of early hominid life in Europe. 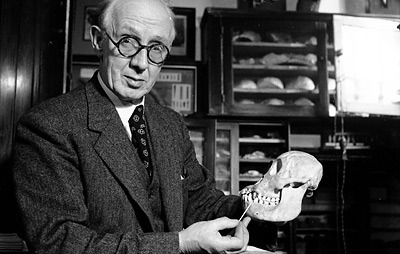 Then in 1953, the fragments, including a jawbone, were tested: they did not contain enough fluorine to be the age that Dawson claimed; worse, the jawbone was that of a 10-year-old orangutan, its teeth ground down to simulate age, and a crude chemical wash applied to the bone to make it appear ancient. No one knows who perpetrated the hoax: Dawson had died in 1916. Very quickly, however, Piltdown became a synonym for phony; and England’s claim to antiquity was cut short by several hundred thousand years. The link between the numbers 1 and 3 is 2 or sometimes may include its fraction like 1½ and 2½. The link of a child to its parents can be numbered! 23 pairs of chromosomes from the father and 23 pairs from the mother. Protozoa exists as a single-celled creature, and have existed billions of years ago, but no single human cell can exist for a day independent of other cells in the tissues of a human body. If protozoan and amoeba have evolved into multi-cellular organisms due to natural selection and the principle of “survival of the fittest and the elimination of the unfit”, why cannot our human cells product of such evolution, exist independently like protozoan? To prove evolution really happened there must be a link! But what is the “missing link“? The link that evolutionists must explain scientifically beyond the shadow of a doubt. This link must not be the link being sought for by most evolutionists. The link between man and apes must not be the intelligent priority! The link must start from the origin of life. How can inorganic matters like soil and water evolve into an amoeba or protozoa?